When Google Glasses first came out, I put in my application to be among the first to access them. As one that is fascinated by technology, and one whose industry has been constantly rocked by technological changes (social media, mobile phones, tablets, all within the past five years, for example) I was intrigued enough to throw my hat in the ring. Cost. These bad-boys tip the scales at a whopping $1,500. Yeah, I love new technology, but not that much, buddy. There really is a reason why they call that the "bleeding edge," isn't there? Creep Factor. Google Glasses, or better said, the people wearing them, are getting a pretty tough rap. 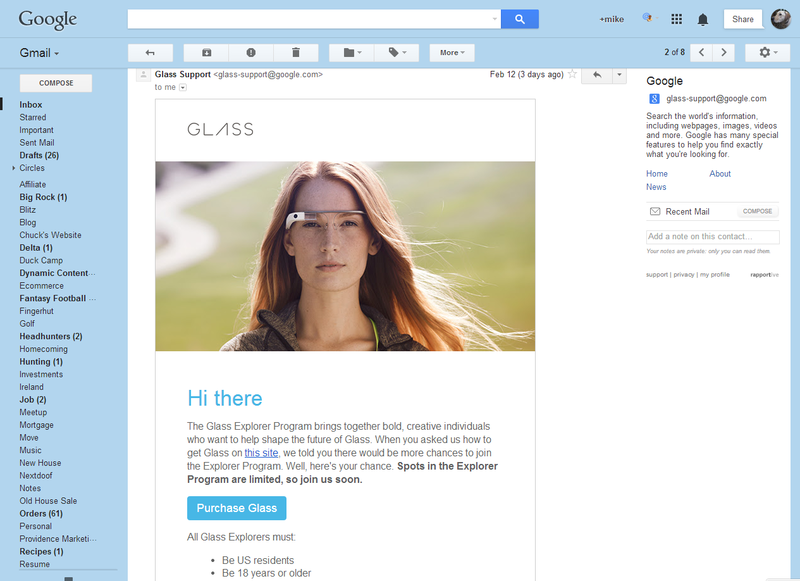 It has gone so far that there's a name for creepy people that wear Google Glasses: "glassholes." To combat this, Google itself has gone as far as publishing a list of dos and don'ts for Google Glass users. Despite the problems, I really want the Glasses. I truly believe that wearable technology to be the next big thing. My success in changing my weight/body/health via my use of a Fitbit Flex is just one example. And that is fairly simple technology. One can only imagine what is going to be coming at us in just a few years' time. Unfortunately, the problems outweigh the benefits for me, at least for now. But I will definitely be watching this space very closely.